US #2573 from the 1991 Space Exploration Issue. On April 5, 1973 (some sources cite April 6 UTC (Coordinated Universal Time)), the Pioneer 11 space probe launched from Cape Canaveral, Florida. The Pioneer program was a series of unmanned missions that explored the planets before leaving the solar system. 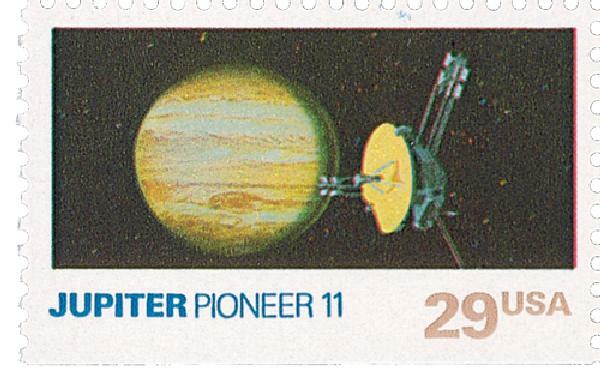 Pioneer 10 and 11 were both approved in February 1969 and were the first probes to be designed to explore the outer solar system. 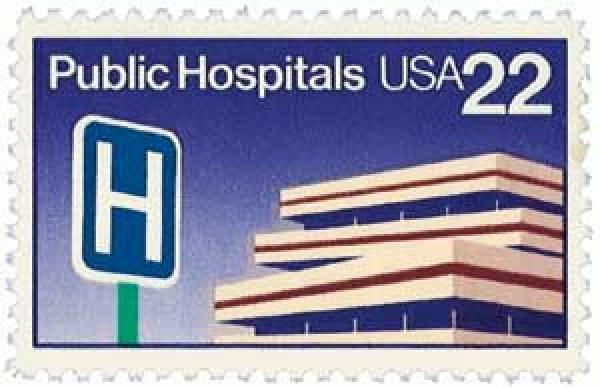 US #1341 was issued on this day in 1968. Click image to order. 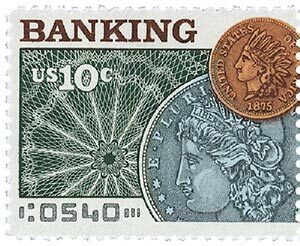 On April 4, 1968, the USPS issued a $1 stamp that, when combined with a parcel post stamp, was used to send mail and packages to American service members overseas. 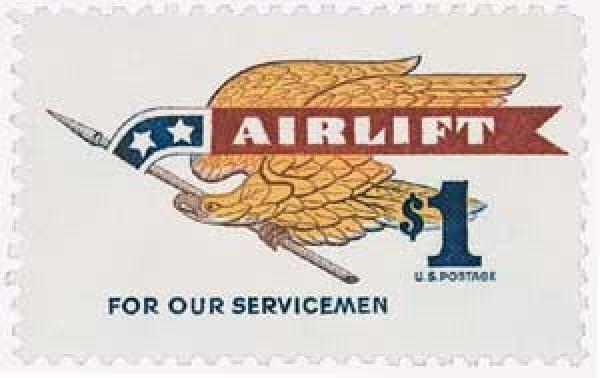 This stamp was issued for parcel airlift, a service that provided for air transportation. It guaranteed delivery on a space available basis to or from a military post office outside of the 48 contiguous United States. US #2036 was issued for the 200th anniversary of this treaty. Click image to order. 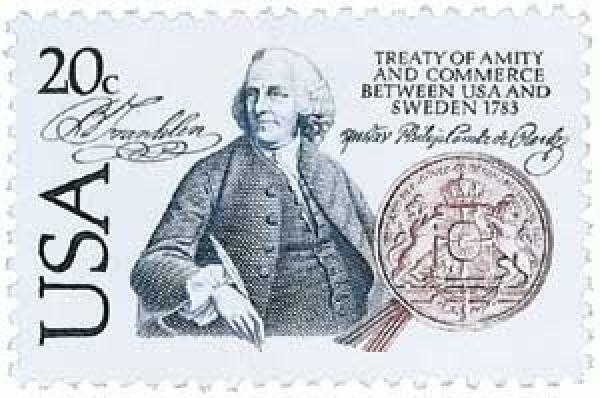 On April 3, 1783, the US signed the Treaty of Amity and Commerce with Sweden, the first such treaty between the US and a nation that wasn’t an ally in the Revolutionary War. In April 1782, Benjamin Franklin and other American Peace Commissioners began peace talks with Great Britain, in the hopes of bringing about an end to the Revolutionary War. As soon as these talks began, Sweden’s King Gustavus III immediately pushed for a treaty of his own with the United States. US #1577 shows an Indian head penny and a Morgan-type Silver Dollar. Click image to order. On April 2, 1792, Congress passed the Coinage Act, also known as the Mint Act, which among other things, created the United States Mint. In colonial America, settlers were expected to follow the rules set by the king of England. While a few charters allowed colonies to produce their own coins, most did not. Then in 1652, the people of the Massachusetts Bay Colony took a chance when England was without a king and established their own mint in Boston. Though a new king later came to power, the Boston Mint struck all its coins for 30 years with a 1652 date, to lead the British to believe all those coins had been minted then. 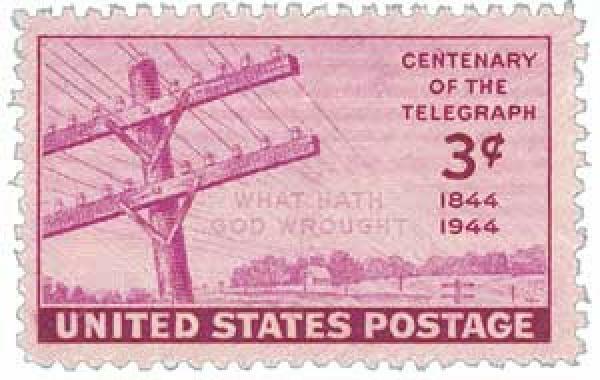 US #924 was issued on the 100th anniversary of Morse’s first long-distance telegraph. On April 1, 1845, the US Post Office Department inaugurated the first commercial telegraph service. Prior to the 1830s, the word “telegraph” was used to describe any system of sending messages over a distance without there being a physical exchange between the sender and receiver. There were only a few such systems in place and they were “optical telegraphs,” which didn’t send messages electronically, rather they were sent visually through the use of visible signals. These systems couldn’t be used at night or in bad weather. US #2210 was issued for the 250th anniversary of Bellevue’s founding. On March 31, 1736, a six-bed almshouse (home for the poor) was founded in New York City with construction starting only a year earlier. That almshouse would eventually become Bellevue Hospital, which is often cited as the oldest public hospital in the US. By 1731, New York City had a population of over 8,000 people. A number of these were described as “vagabonds and idle beggars.” To help these people, work began in 1735 on the construction of a public workhouse and house of correction.